Marking the start of groundworks for Newark’s new fire station are (centre, with spade) the chairman of Nottinghamshire Fire Authority, Brian Grocock, and (right) Newark station officer Seth Armstrong. They are with (left to right) Nottinghamshire Fire and Rescue Service head of procurement and resources Ian Pritchard; Major Contracts director for Gelder Group, Kevin Manterfield-Ivory; site manager Ian Keogh and contracts manager Gavin Parker. Newark Fire and Rescue Station will start to take shape now all demolition works have been completed. A traditional sod cutting ceremony took place last week to mark the next phase of the project. 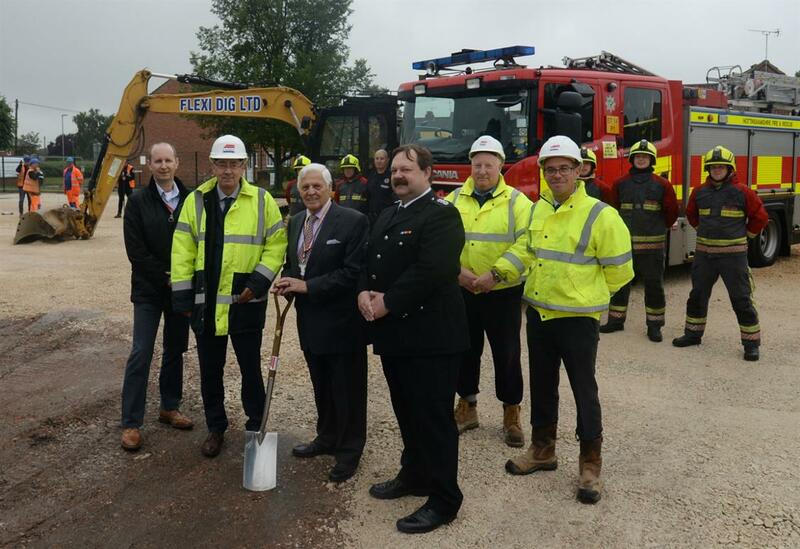 The ceremony was attended by Kevin Manterfield, Gavin Parker and Ian Keogh along with the chairman of Nottinghamshire Fire Authority, Brian Grocock, and Newark station officer Seth Armstrong.